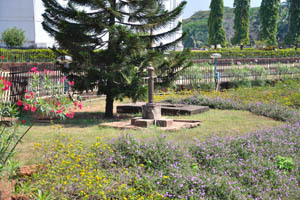 Cemetery beside the Church of St. Francis of Assisi. 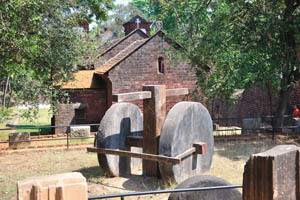 Wooden cross and stone wheels. 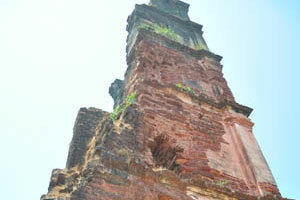 Stone cross is on the top of the brick tower. 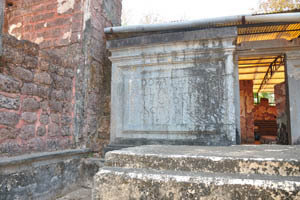 Entrance to the Church of St. Francis of Assisi. 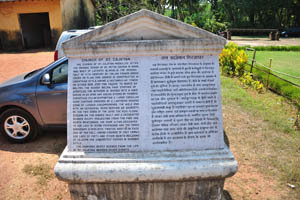 Church of St. Francis of Assisi, the information board. 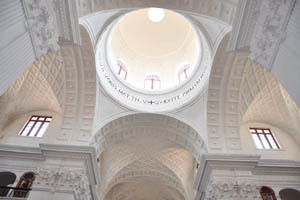 Church of St. Francis of Assisi, the inner interior. 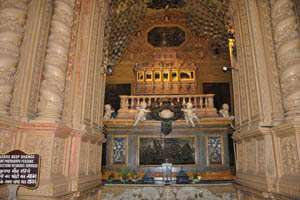 Church of St. Francis of Assisi, the main altar. 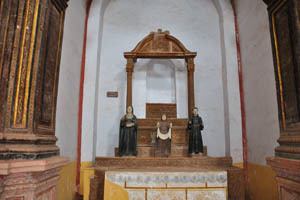 Church of St. Francis of Assisi, Capela de Porceuncula. 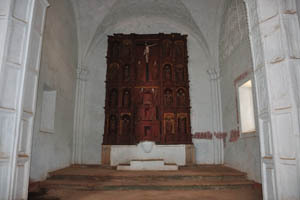 Church of St. Francis of Assisi, Capela de S Isabel. 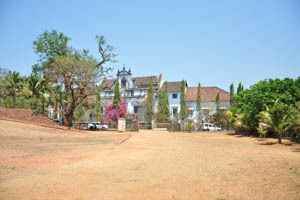 Church of St. Francis of Assisi, Capela de N.S Dos Milagres. 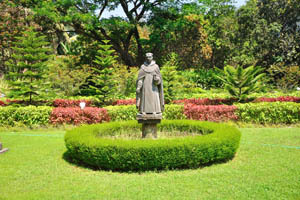 Church of St. Francis of Assisi, a large statue of St. Francis of Assisi and Jesus on the cross. 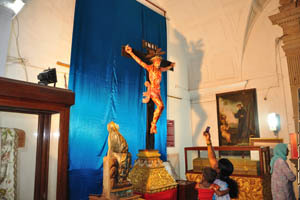 Church of St. Francis of Assisi, Jesus on the cross. 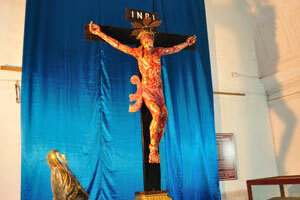 Church of St. Francis of Assisi, Jesus the Nazarene, King of the Jews. 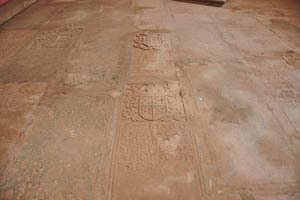 Church of St. Francis of Assisi, carvings on the floor. 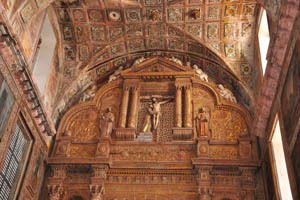 Walls retain painted panels depicting scenes from the life of St Francis of Assisi. 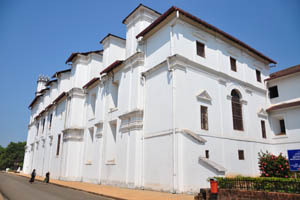 Church of St. Francis of Assisi is a three tier building. 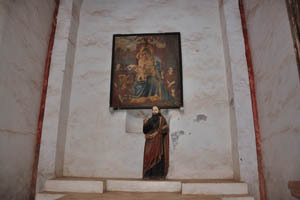 Church of St. Francis of Assisi, a mother and a child. 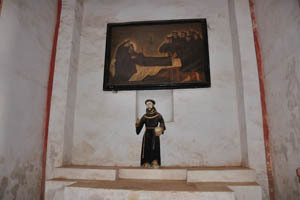 Church of St. Francis of Assisi, one of the paintings. 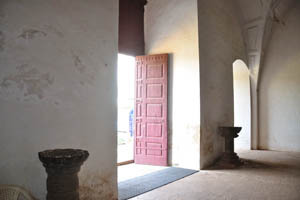 Church of St. Francis of Assisi, the main door is open. 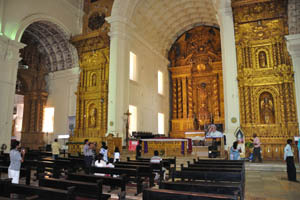 Church of St. Francis of Assisi, the tourists inside the building. 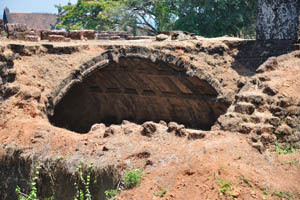 Archaeological survey of India celebrates 150 Anniversary. 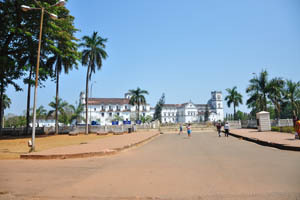 Basilica of Bom Jesus in the far distance. 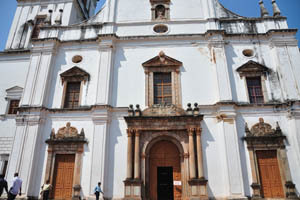 Basilica of Bom Jesus, close-up view. 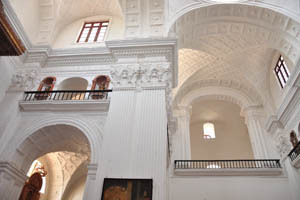 White walls of the Archiepiscopal palace. 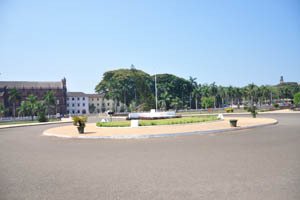 Huge square amongst the churches. 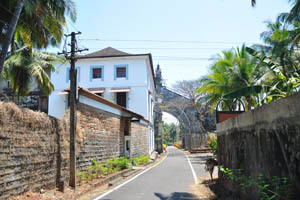 Road along the Archiepiscopal palace. 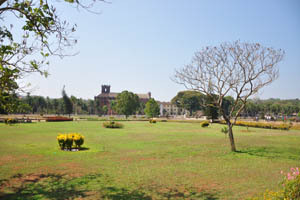 Trees beside the Archiepiscopal palace. 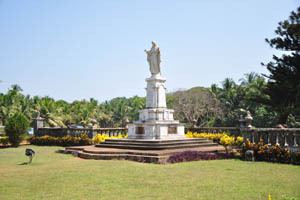 Statue dedicated to the Sacred Heart of Jesus. 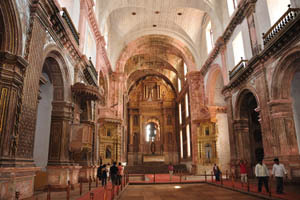 Se Cathedral de Santa Catarina. 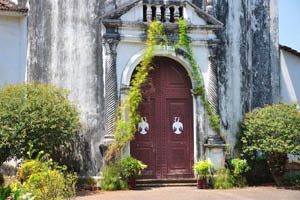 Entrance to the Se Cathedral. 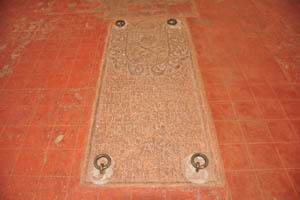 Se Cathedral, the information board. 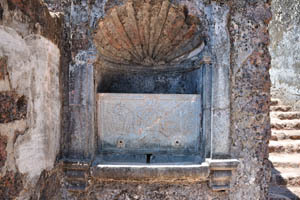 Water column in a shape of a cross. 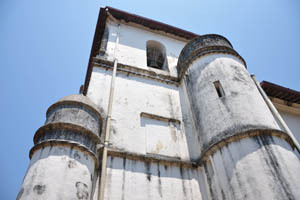 Octagonal towers of the Church of St. Francis of Assisi. 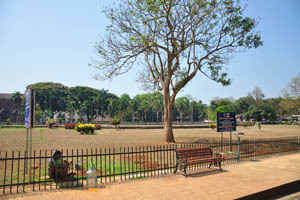 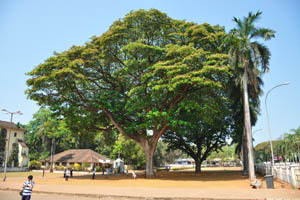 Huge tree is beside the Basilica of Bom Jesus. 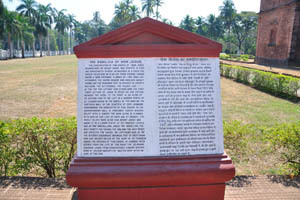 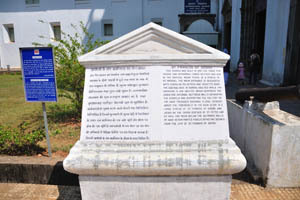 Basilica of Bom Jesus, the information board. 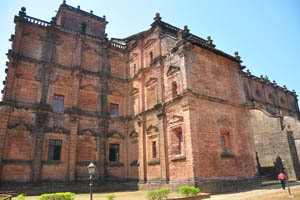 Basilica of Bom Jesus, the side view. 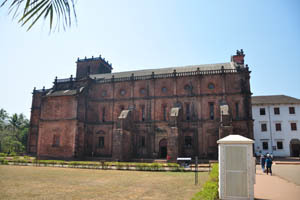 Basilica of Bom Jesus, the back view. 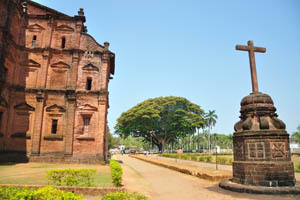 Basilica of Bom Jesus, the cross at the rear side. 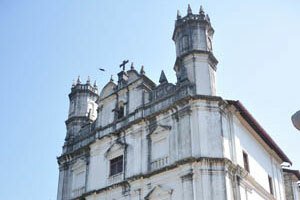 The most tall part of the Basilica of Bom Jesus. 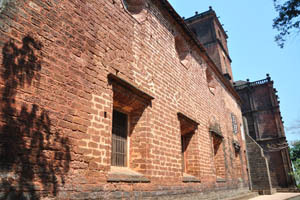 Red bricks of the Basilica of Bom Jesus. 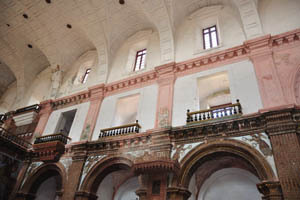 Basilica of Bom Jesus, the windows of the second tier. 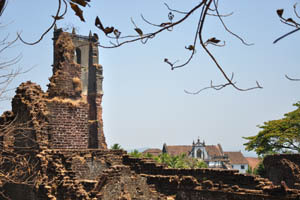 Church of St. Francis of Assisi and Se Cathedral, the view from the Basilica of Bom Jesus. 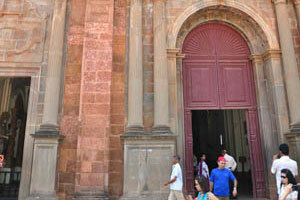 Basilica of Bom Jesus, the ornamented entrance to the church. 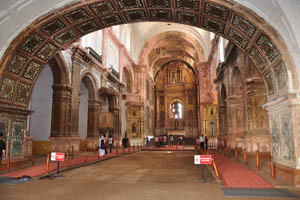 Basilica of Bom Jesus, the interior view towards altar. 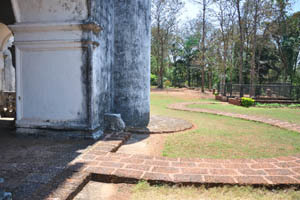 Basilica of Bom Jesus, the balcony shape structure. 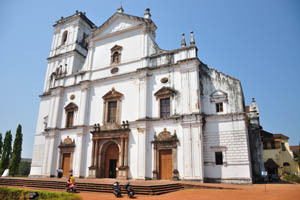 Basilica of Bom Jesus, Pope Francis. 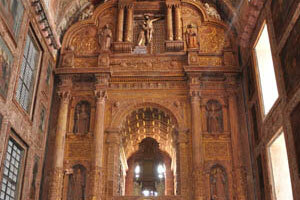 Basilica of Bom Jesus, HI MHOJI KUDD (This is my body). 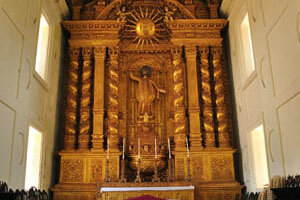 Basilica of Bom Jesus, the jesuit's symbol in the shape of the sun. 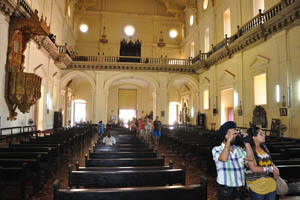 Basilica of Bom Jesus, the main hall. 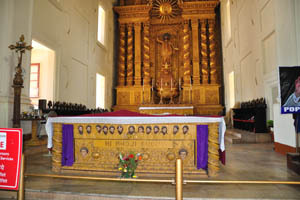 Basilica of Bom Jesus, the relics of St. Francis Xavier. 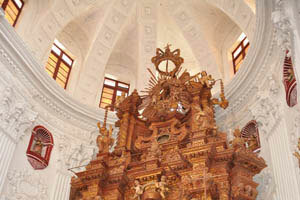 Basilica of Bom Jesus, the inner ornaments in the jesuits church. 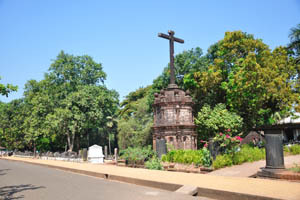 Basilica of Bom Jesus, Jesus on the cross. 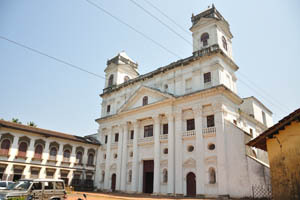 Basilica of Bom Jesus, Jesus on the cross INRI. 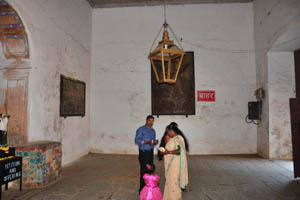 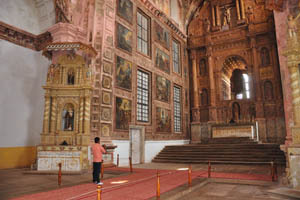 Basilica of Bom Jesus, the hall with the paintings. 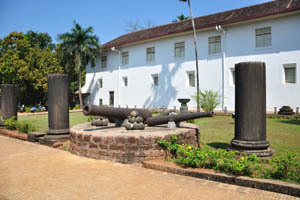 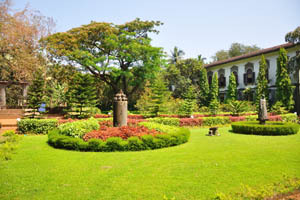 Basilica of Bom Jesus, the inner courtyard. 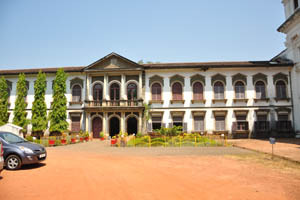 Basilica of Bom Jesus, the two tiers of the inner courtyard. 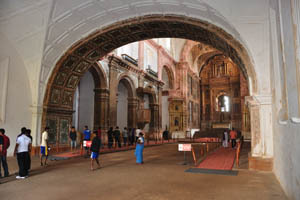 Basilica of Bom Jesus, the arched pavillion. 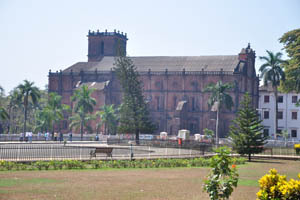 Basilica of Bom Jesus, the tower with the bell. 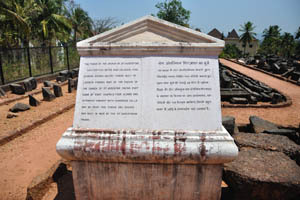 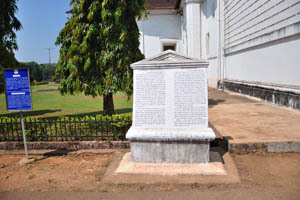 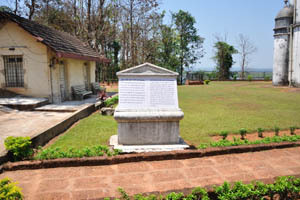 Basilica of Bom Jesus, petition and offering. 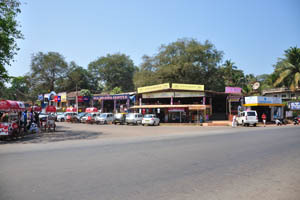 State Bank of India on the intersection. 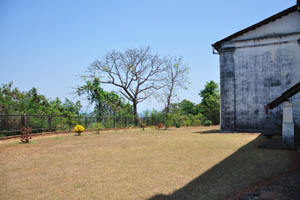 The Convent of St. Cajetan, the landscape design. 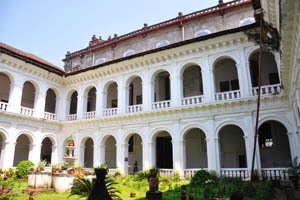 The Convent of St. Cajetan, the sculpture of the monk. 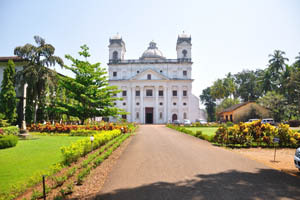 Pastoral Institute is beside the Convent of St. Cajetan. 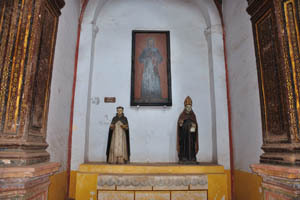 Church of St. Cajetan, the information board. 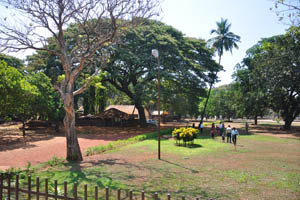 Courtyard of the Pastoral Institute. 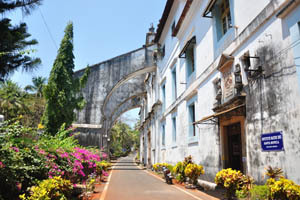 The Convent of St. Cajetan. 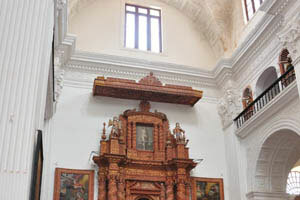 Church of St. Cajetan, the high altar. 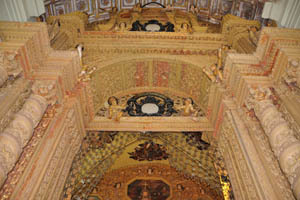 Church of St. Cajetan, the ceiling. 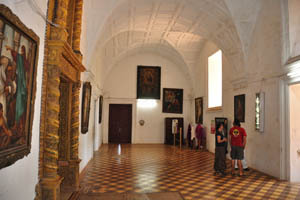 Church of St. Cajetan, the adornments and the paintings. 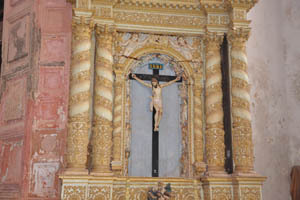 Church of St. Cajetan, Jesus on the cross. 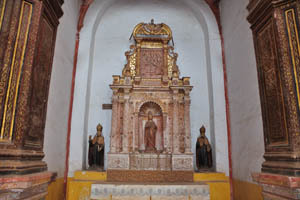 Church of St. Cajetan, the adornment with the crown over it. 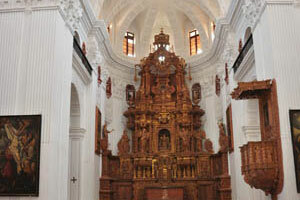 Church of St. Cajetan, the adornment with the sun of jesuits on its top. 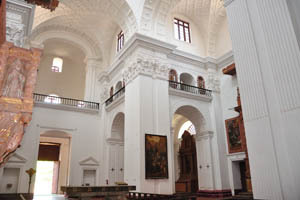 Church of St. Cajetan, the second tier of the building. 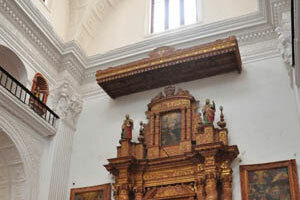 Church of St. Cajetan, the small balcony on the top tier. 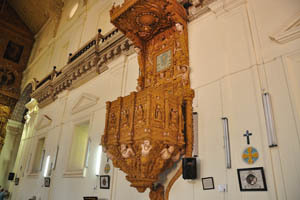 Church of St. Cajetan, the bench at the entrance. 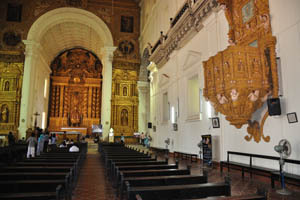 Church of St. Cajetan, the carvings with the shape of a skull and bones on the floor. 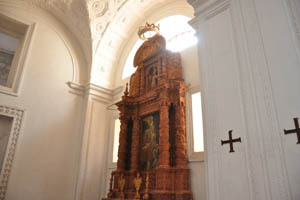 Chapel of St. Catherine of Alexandria. 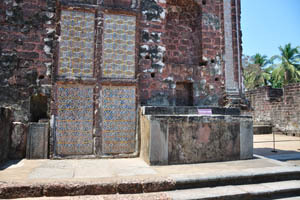 Closed door of the Royal Chapel of St Anthony. 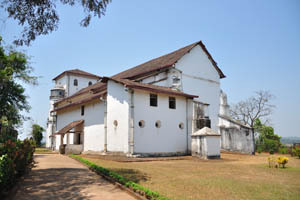 Royal Chapel of St Anthony. 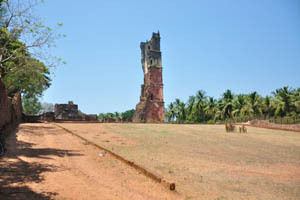 St. Augustine's tower and the ruins around it. 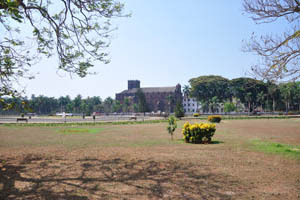 St. Augustine's tower and the Convent of St. Monica. 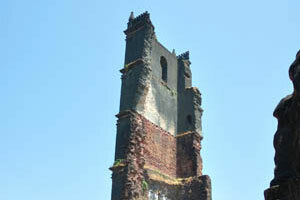 St. Augustine's tower and the Convent of St. Monica, close-up view. 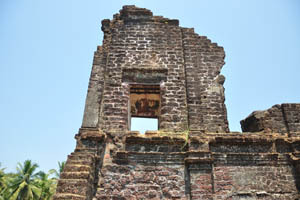 Ruins of St. Augustine complex, the two windows. 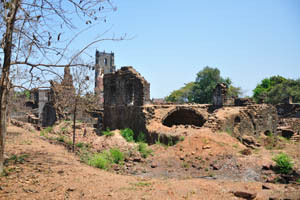 Ruins of St. Augustine complex, the arch. 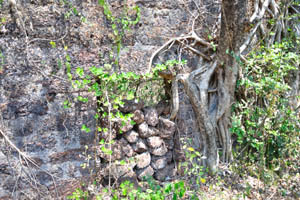 Ruins of St. Augustine complex, the ficus tree. 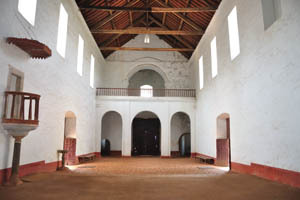 Ruins of St. Augustine complex, the underground room. 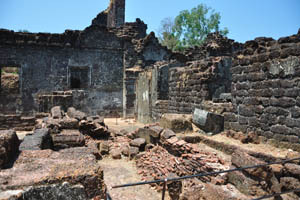 Ruins of St. Augustine complex, close-up view of the underground room. 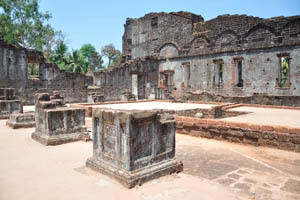 Ruins of St. Augustine complex. 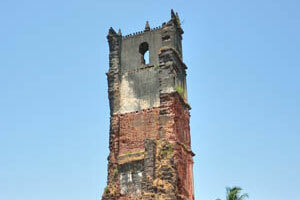 St. Augustine's tower at noon. 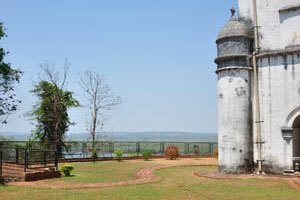 St. Augustine's tower in a sunny day. 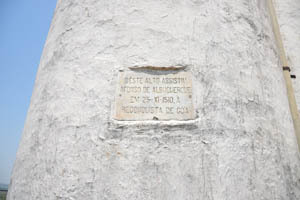 The base of the St. Augustine's tower. 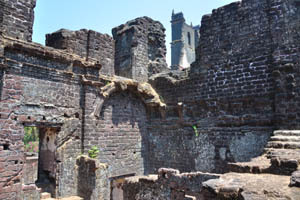 Ruins of St. Augustine complex, the inside view. 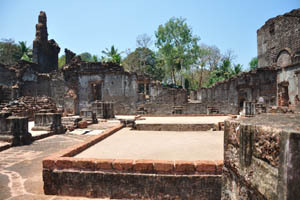 Ruins of St. Augustine complex, the cleanliness inside. 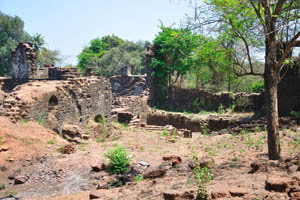 Ruins of St. Augustine complex, the green forest is outside it. 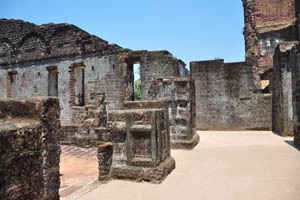 Ruins of St. Augustine complex, the red bricks. 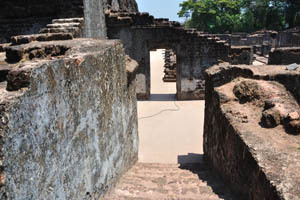 Ruins of St. Augustine complex, the ruins look as if they are liquid. 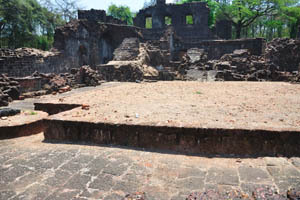 Ruins of St. Augustine complex, an empty place. 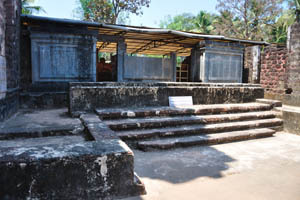 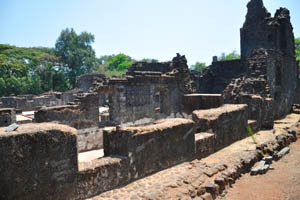 Ruins of St. Augustine complex, too much work for the conservation. 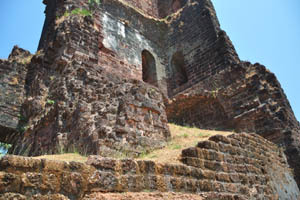 Ruins of St. Augustine complex, the thin bricks. 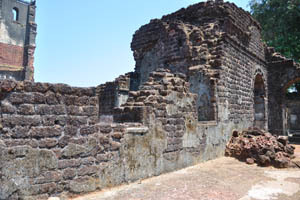 Ruins of St. Augustine complex, the thick wall. 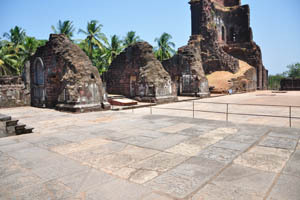 Ruins of St. Augustine complex, the smooth floor covering. 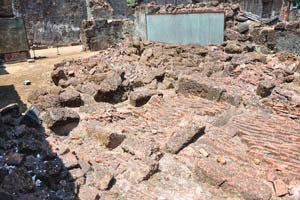 Ruins of St. Augustine complex, the roof of the underground structure. 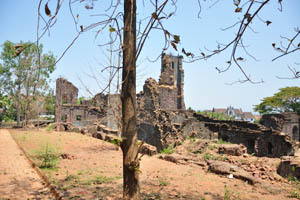 Ruins of St. Augustine complex, the pointer to the convent. 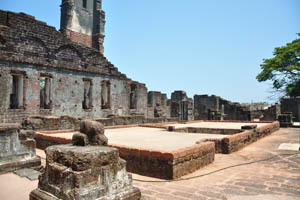 Ruins of St. Augustine complex, the pointer to main altar. 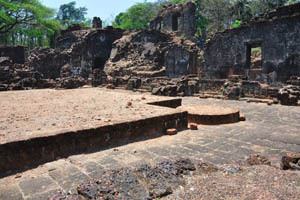 Ruins of St. Augustine complex, the unknown structure. 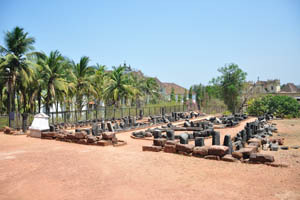 Ruins of St. Augustine complex, the remains from the walls. 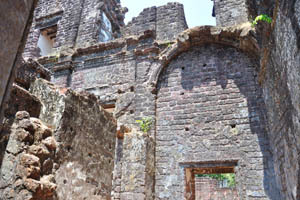 Ruins of St. Augustine complex, the window openings. 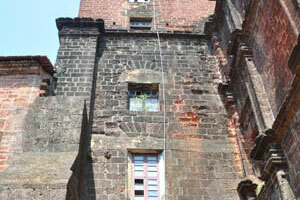 One can see the top of the St. Augustine's tower from this place. 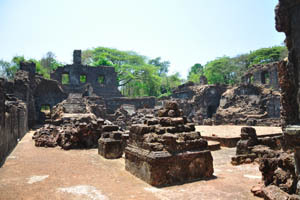 Ruins of St. Augustine complex, the remains of the second tier. 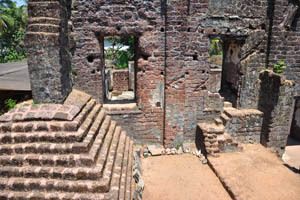 Ruins of St. Augustine complex, the stairway is going down. 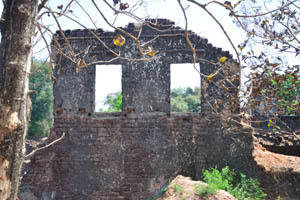 Ruins of St. Augustine complex, the tall walls. 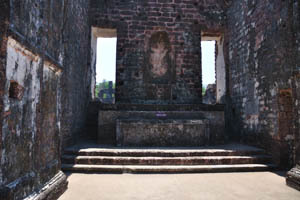 Ruins of St. Augustine complex, main altar dedicated to Our Lady of Grace. 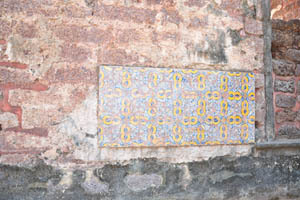 Ruins of St. Augustine complex, a fragment of the ceramic tile. 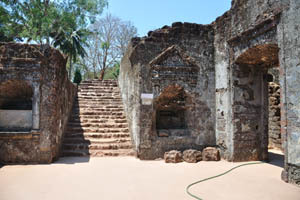 Ruins of St. Augustine complex, the entrance to the main altar. 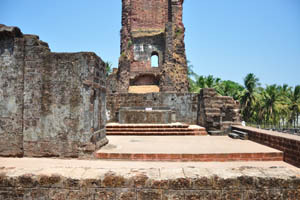 Ruins of St. Augustine complex overlooking the coconut palms. 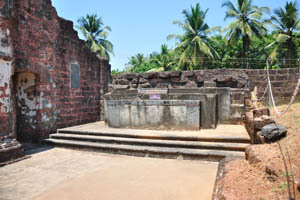 Ruins of St. Augustine complex, the altar of Our Lady of Sorrow. 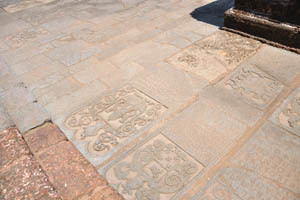 Ruins of St. Augustine complex, the carvings on the floor. 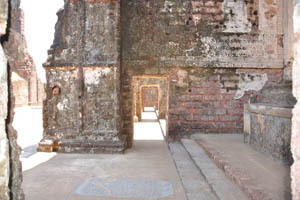 Ruins of St. Augustine complex, a series of arches. 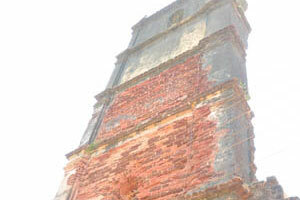 St. Augustine's tower is a very thin wall today. 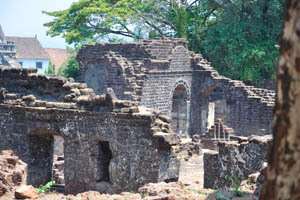 Ruins of St. Augustine complex, the Chapel of St. Joseph. 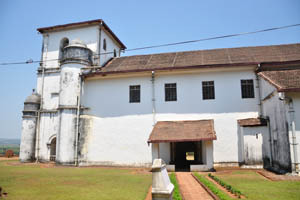 St. Augustine's tower, the foundation of the building. 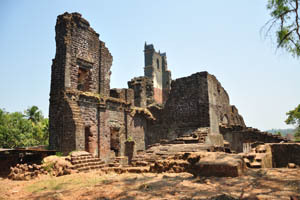 Ruins of St. Augustine complex, the chapel of Our Lady of Good Success. 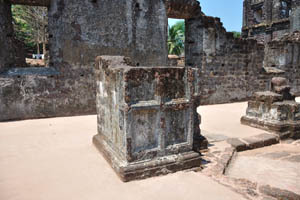 Foundation of the St. Augustine's tower, close-up view. 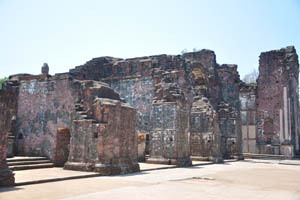 Ruins of St. Augustine complex, the power of the medieval ages. 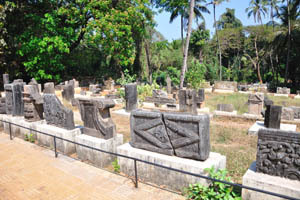 Ruins of St. Augustine complex, the set of the ancient construction stones. 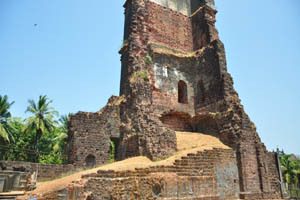 St. Augustine's tower, the structure of the wall. 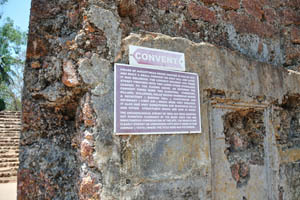 St. Augustine's tower, the information board. 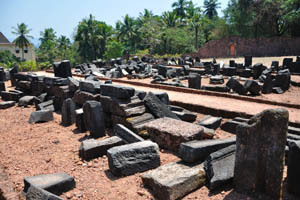 Ruins of St. Augustine complex, the black ancient stones. 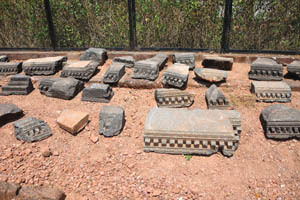 Ruins of St. Augustine complex, the small fragments. 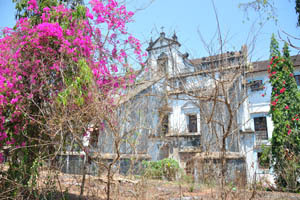 View of the Convent of St. Monica through the pink flowers. 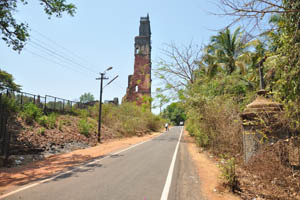 View of the St. Augustine's tower from the road. 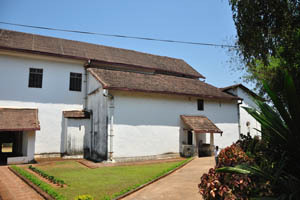 White building of the Convent of St. Monica. 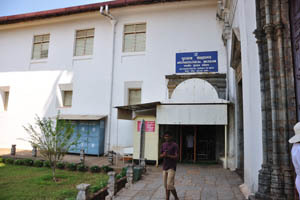 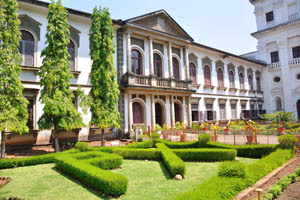 Convent of St. John of God. 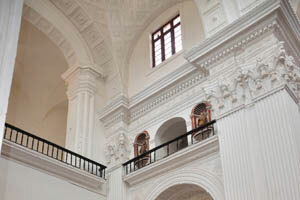 Institute Mater Dei Santa Monica. 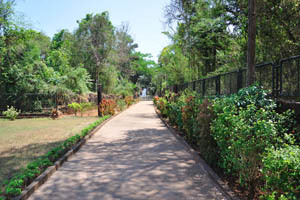 Road along the Institute Mater Dei Santa Monica. 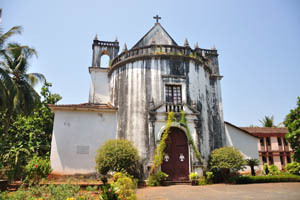 Church of Our Lady of the Rosary. 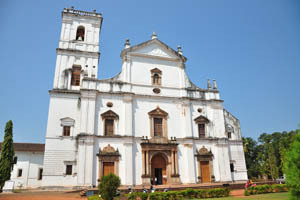 Church of Our Lady of the Rosary, the information board. 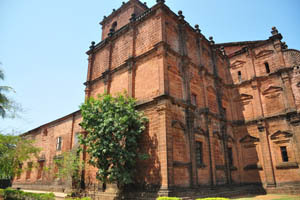 Church of Our Lady of the Rosary, the side view. 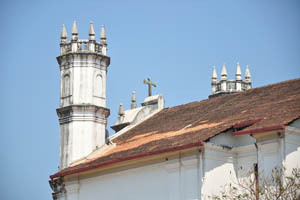 Church of Our Lady of the Rosary has been covered with the tile roof. 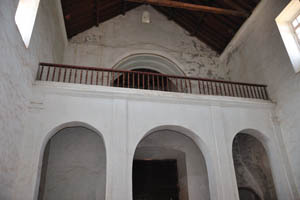 Church of Our Lady of the Rosary, the second tier. 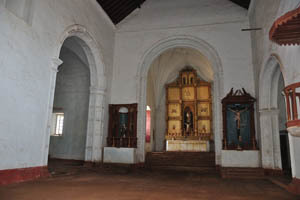 Church of Our Lady of the Rosary, the inner interior. 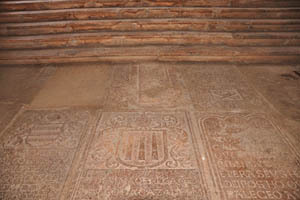 Church of Our Lady of the Rosary, the carvings on the floor. 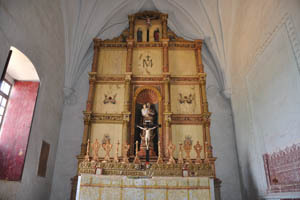 Church of Our Lady of the Rosary, the altar with Jesus on the cross. 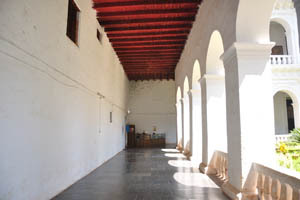 Church of Our Lady of the Rosary, the main and the only hall. 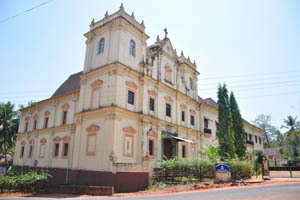 Church of Our Lady of the Rosary, Jesus on the cross. 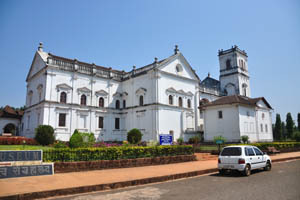 Church of Our Lady of the Rosary overlooking the Mandovi river. 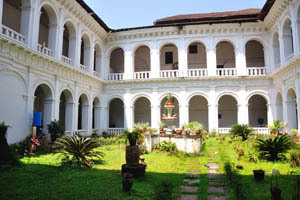 Church of Our Lady of the Rosary, the inner courtyard. 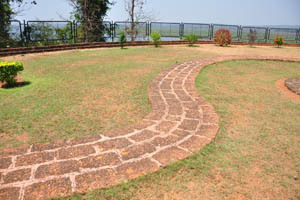 Church of Our Lady of the Rosary, the winding pathway. 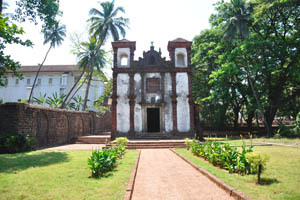 Church of Our Lady of the Rosary, Deste Alto Assistiu Afonso de Albuquerque. 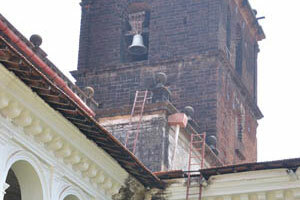 Church of Our Lady of the Rosary, the bell of the church. 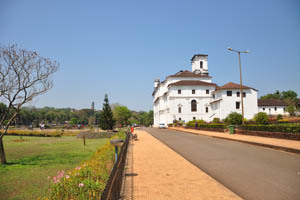 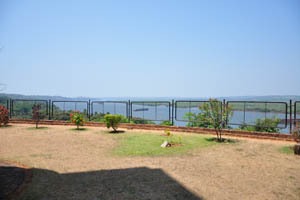 Church of Our Lady of the Rosary, the winding pathway overlooking the Mandovi river. 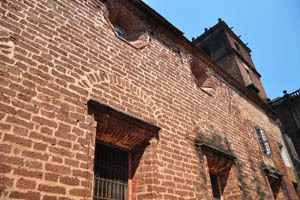 Church of Our Lady of the Rosary, the corner of the building. 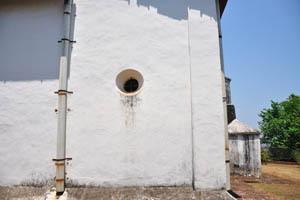 Church of Our Lady of the Rosary, the small round window. 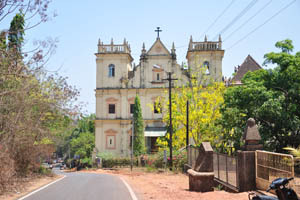 Church of Our Lady of the Rosary, the road. 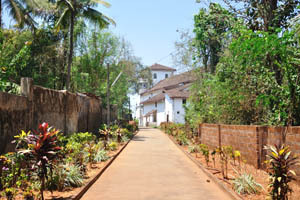 Road along the Convent of St. Monica. 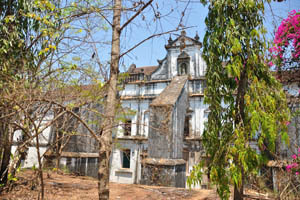 Convent of St. John of God, the side view.